Rotary Ireland had traditionally achieved the status of one of the top donating Districts in RIBI, with one of the highest per capita giving records. Unfortunately, this appears to be changing, with fewer clubs than before meeting donation targets. 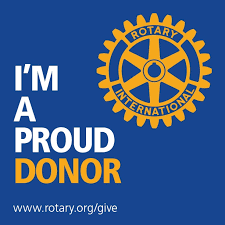 The donation target is the EREY – Every Rotarian Every Year – commitment, we make as Rotarians, to each donate a minimum of $100 annually to our Foundation. This can be done through personal donation (see Sustaining Member page), through fundraising (like weekly club raffles), by participating in the Postal Survey, or through club subscriptions. It is important that we all strive to meet the donation target, because the money we donate returns to us, in the form of Rotary Foundation funding for District Grants and Global Grants. These are key to our delivery of the projects that are core to our mission of doing good in the world, and it is vital that we maintain the capacity to fund them. Unless we raise our game, by donating more to our Foundation, we will lose a key part of our ability to make a difference! Foundation has also been central to a succession of District led projects, funded through Global Grants. These include the Sand Dam projects in Kenya, the current 538 and H2O water projects, and the very successful Project Ciara, a project that has transformed the lives of communities in the Rombo area of Kenya; developing a borehole and building a 20km pipeline, to bring clean potable water to 6 villages. Read more about these projects, and others, in the International Service pages. These projects are making a difference, but they can only continue to do so if we step up to the challenge of funding our Foundation, so that it can support our projects, now and into the future.